Intel wants to inject passion and excitement into mobile chat through a new app that relies on face-tracking technology to assess facial expressions and mood. With Pocket Avatars, users can chat with friends using animated three-dimensional avatars, but there's a twist. 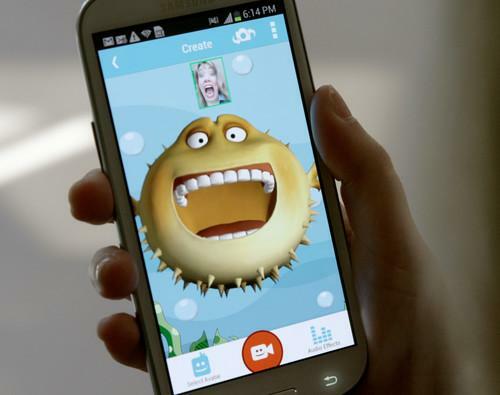 A camera on a mobile device tracks a user's face and expressions, and those emotions are reflected on the avatar during a chat. The avatar serves as an alter-ego for those who don't to put their real face on screen, said Mike Bell, vice president and general manager of the New Devices Group at Intel. "It's just a fun thing on top of standard messaging," Bell said. Emoticons have been a standard tool for expressions in text messaging. An animated chat that reflects a real person's mood is more engaging, Bell said, adding that if a user is angry or happy, the avatar will show it, Bell said. The camera captures moving faces, lighting conditions and a range of emotions such as smiles, blinking eyes or kisses. The recordings are processed through an algorithm and then mapped on the avatar in real time. The Pocket Avatars app then deletes the information. "We are not storing databases with people's faces," Bell said. "We're not selling ads or information. This is about social messaging, using an animated avatar. It's not mining [data]." One wouldn't expect chat software from Intel, which specializes in making chips. But Intel's research division has a diverse group of scientists and social scientists researching technology and other areas such as health and human behavior. Pocket Avatars was being kicked around the labs for a little while, and it represents the fun side of Intel's research team, Bell said. Chat and messaging software companies are also being valued highly so there is momentum in that area, Bell said. About 20 trillion over-the-top messages -- messages sent through chat software -- will be sent this year, and Intel wants a piece of that market, Bell said. "Some of the evaluations of those companies... it's not a joke," Bell said. Facebook said earlier this year it would acquire WhatsApp in a stunning deal worth US$19 billion. Bell's New Devices Group is also charged with exploring opportunities in the wearables market. Pocket Avatars represents Intel's willingness to experiment and dabble in new areas, Bell said. But some experiments for Intel haven't panned out. Intel dropped plans to launch a TV service after failing to reach license agreements with content providers, and also shut down its own app store for PCs called AppUp. Pocket Avatars is free for download and comes with forty avatars. Some avatars are free while others cost $0.99 for unlimited use. The avatars available include famous people, Lego characters and also YouTube star Annoying Orange. Intel plans to add more avatars and capabilities as the app evolves, Bell said.